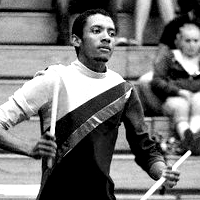 Anthony's indoor drumline experience continued with the Bakersfield College Drumline under the instruction of David Ellis. He marched snare for three years and was center snare in 2012. As a student at Bakersfield College studying industrial drawing/design, he continues to work with BC's fall semester drumline where he serves as the assistant battery coach of the Renegade Line and as a battery/visual tech for the Indoor Line. In addition to his performance and educational experience, Anthony has been an admin team member of the Golden Empire Drum & Bugle Corps since 2014.